Now’s the Time to Start Living in Your Dream Home at a Fraction the Cost You’d Expect! It’s Finally Time… Enjoy Warm San Diego (“America’s Finest City”) and Live Your Precious Retirement Years in the “Lap Of Luxury” (Famous Del Mar)…For Pennies On the Dollar! 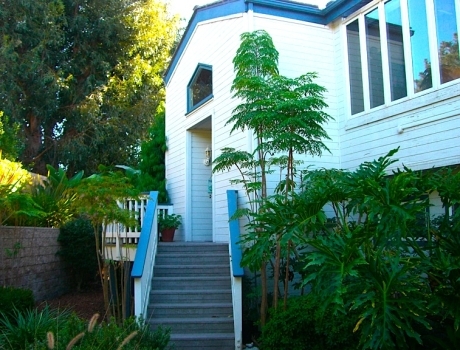 Del Mar, California, Four Bedroom Furnished Home, 2,900 Sq Ft. with Ocean View, 2 Blocks from the Beach. That’s right. 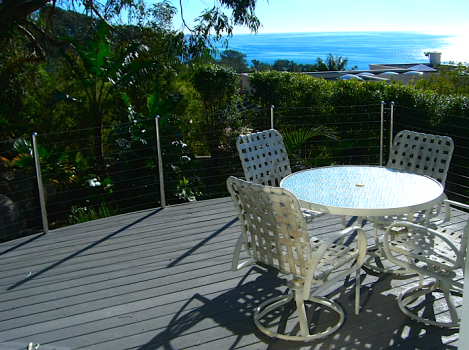 Your lifelong dream can still be fulfilled: an ocean view, privacy, walk to the beach and year-round moderate weather. You have heard all the sayings: You only live once. Carpe diem. No regrets. Live your dreams. Life is short. You won’t live forever. These are the best years of your life. There’s some truth to them. But realistically, what are the chances you’d be able to live in a multi-million dollar home, just 2 blocks from the majestic Pacific Ocean? Why do I say that? My name is Eric and my wife is Diane. We have recently moved out of state. We are sad to leave our home of 20 years, but our loss is your gain. We are renting out gorgeous home and it might just be to you. First, let’s take care of the basics. WHERE: The home is in Del Mar, California. Yes, it’s the world famous Del Mar, home of surf and turf (beaches and the racetrack). It is an incorporated city, 20 miles north of San Diego, with a population of 5,500. Here what you’ll see as you head towards your driveway after as you enter your gated community. WEATHER: The average summertime temperatures are a comfortable 75-78 and wintertime temperatures are a cool (but not cold) 62-65. Extreme hot summer or fall days are in the 80’s and extreme cold winter days are in the 50’s. Here, even in midwinter, the trees are green! 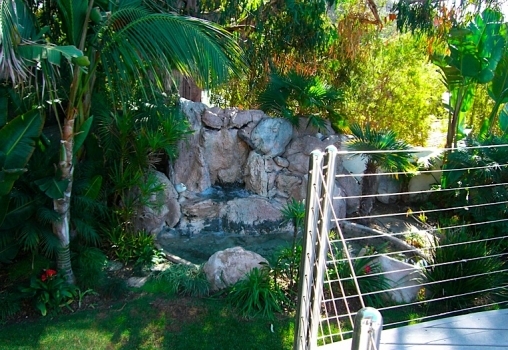 You can sit out on your back deck year-round and enjoy the greenery around your own personal waterfall (see below). 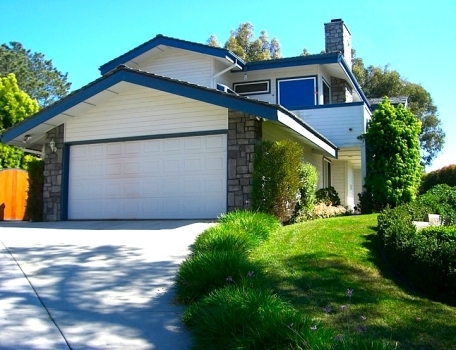 WHAT’S CLOSE: Less than 5 minutes from grocery stores, movies, health food stores, the world famous Del Mar Racetrack, the annual county fair, the home and garden show, the weekly Farmer’s market, the Torrey Pines golf course (home of the 2008 U.S. Open), and walking distance to the beach. You’re less than 5 minutes from the main north-south freeway (I-5). Also within a 5-minute drive are 21 restaurants, three of which are on the beach, ready for a romantic sunset dinner. Life is, indeed, good in Del Mar. Beauty? “I have lived in many places over the years, and there is no question in my mind that San Diego is my favorite city. It offers perfect weather, friendly people, and more tourist attractions than you can shake a fist at," says tour guide Bill Seaton. Do you take photos? “San Diego is my favorite city to photograph. I find the beauty of the landscape to be mind-boggling, offering so many beautiful and varied places to photograph,” says James Blank, America’s most prolific postcard photographer. You are 20 minutes from La Jolla (famous for the Birch Aquarium, shops and restaurants) and the abundant sea life at the Children’s Pool beach park, famous for sea lions for close-up viewing. You are a 25-minute drive to the San Diego airport, the world famous zoo, Seaworld, whale-watching, Balboa Park, museums, the Point Loma Lighthouse and Hotel Del Coronado. San Diego has a fabulous new baseball park (Petco Park) for the Padres and the San Diego Chargers are a solid team every year. Do you play golf? Golf Digest named San Diego "One of the Top 50 Golf Destinations in the World". Golfers enjoy over 90 courses located within an hour’s drive of Del Mar. Oh wait, I just remembered: you can see and hear fireworks from your own back deck during the annual Fourth of July celebrations. As the movie classic title said: That’s Entertainment! THIS HOME: This is an amazing two-story (split level) 2,900 sq.ft. home. There are three bedrooms and an ocean-view office. There are four (very convenient!) baths and a gas fireplace. When the surf is up, you’ll hear breaking waves from your bedroom window. Otherwise expect total quiet or the sound of your own waterfall. Your bedroom is spacious, almost Zen-like. See below. THE MASTER BATHROOM: The master bathroom offers a Jacuzzi tub, huge shower, dual sinks and special make-up counter. 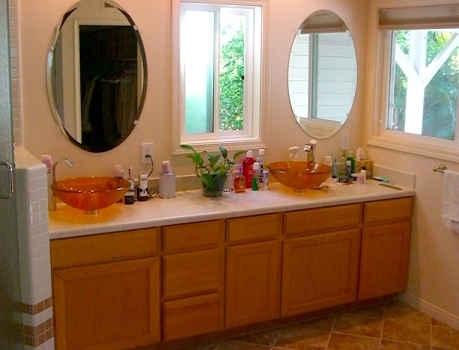 Raised vessel sinks mean less bending over and greater ease in personal care. The three windows let in the fresh air, sunshine and sounds of the waterfalls. The bathroom is huge, so we’re only showing a part of it. See below. THE YARD: This house has a small yard (1/4 acre). The trees are all positioned for maximum privacy. The shrubs are easy to maintain, flowers are abundant and there’s a small rose garden. 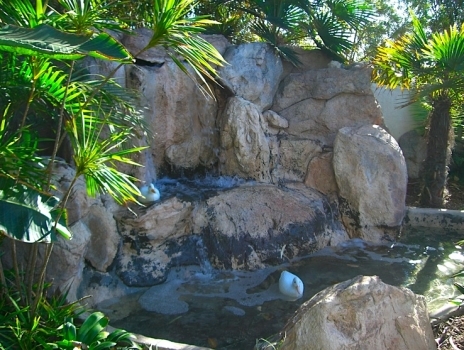 There are two waterfalls on the property, one near the front entry yard and one in the back; they mask nearby traffic noise and provide a soothing backdrop to living in paradise. The back waterfall is shown below. KITCHEN: The newly remodeled kitchen has beautiful custom Thomasville cabinets. The counter surface is a rare black abalone granite that sparkles in the sun. 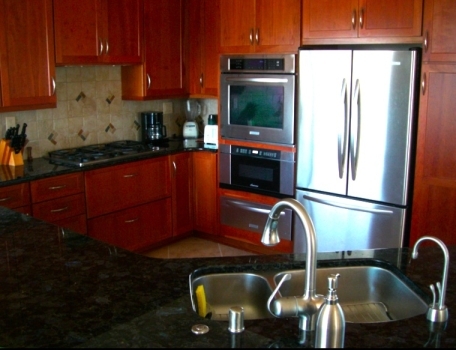 The appliances (warming oven, microwave, convection/traditional oven, refrigerator, dishwasher) are all “top of the line” brands and provide quiet quality. There’s a pantry, plus drawers with the easy open and auto close feature. You can enjoy the kitchen whether you’re cooking for the two of you (as we did for years) or cooking for company (plenty of room for that, too)! See below. SPECIAL TOUCHES: Laundry room is indoors and you have a 2-car garage. Downstairs, in the more personal areas, you'll enjoy a new comfortable, luxurious carpet. Upstairs your new home has easy to maintain ceramic tile floors and a gas fireplace. The aquarium is a massive 240-gallon salt-water tank. 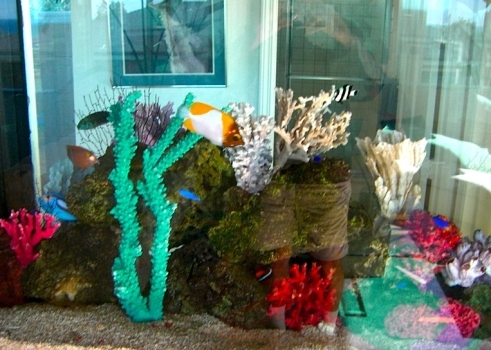 It's hard to capture in a photo, since the fish are active and the tank is see-through! But rest assured, it's a beauty! And best of all, it is maintained weekly by a professional. RELAXING TIME: One of the best ways to relax and unwind is to sit quietly listening to nature. 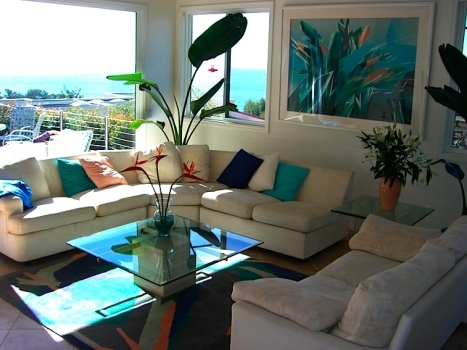 From this spacious living room, you can hear the sounds of the ocean, birds, or your own waterfalls. Both of us have found that watching the tropical fish is amazingly entertaining and stress reducing. This is the tank view in your amazing upstairs living room. See the picture below. As you can see with this room, the design is to take in the outdoors and let in the light! The upstairs is designed to take advantage of the views. It’s the public area and there are no window coverings. 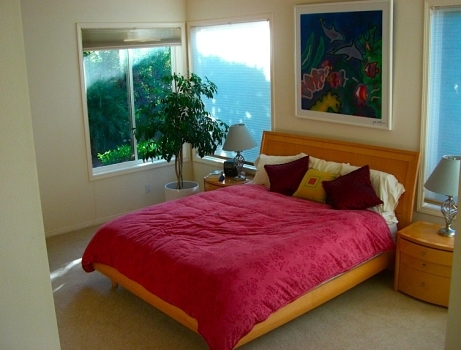 Downstairs is for privacy and every bedroom has fully private window coverings. THE NEIGHBORHOOD: There are nine other homes in the neighborhood; only one of them has children, less than 10 years old. All of them are easy to talk to and we consider them friends. This yard, as well as the neighbor’s landscaping is mature with abundant shrubs, trees and flowers. SECURITY: This home is in a security-gated cul-de-sac. There’s a remote for your car and touch keypad for access for guests through the heavy metal gates. The beautiful custom wood front gate in front of the home can be locked. The front door is dead bolted. The neighbors know each other and report any suspicious activity. You’ll be given a list of all the names of the neighbors and we’ll email them your contact information. Utilities are not cheap. Gas, electricity and water are all higher than the national average. Fortunately, the kitchen stove is gas and the winter heating is generally pretty low in costs. 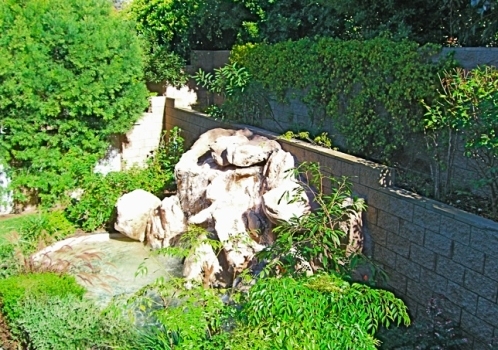 Much of the side and back yard have low water usage landscaping. Driveway is shared with a neighbor. The bottom half of the driveway begins so that both you and the neighbor pull up into it, then the driveway flares off to separate garages. It’s designed this way with several other homes in the neighborhood, too. I don’t think it’s ideal, but we’ve never had any problems with it. Traffic noise during midday. To the east of the house, on the other side of a small hillside is a traffic throughway. You won’t see the road (trees mask the road), but you will hear cars now and then. To reduce the effects of the traffic, we have grown 15-45 foot trees to block the visual effects and we have put in two waterfalls to create a buffering sound of rushing water. The walk to the beach is a zigzag. This home is about 300-400 yards directly east of the Pacific Ocean. But there are homes between the ocean and us. You’ll have to walk either north about 5-10 minutes for a great view from above the cliffs or walk south for 10-14 minutes along a footpath to put your feet into the white sands of the Pacific. San Diego traffic is busy! There’s no way to “sugar coat” this. San Diego is a bustling city of a million people and you’ll want to learn when and where the traffic is busiest, so you can avoid the traffic. The house is 20 years old. That's right, it was built in the late 1980's, which means there will be signs of aging. It's in great shape, but it's not brand new. Del Mar has great weather, but not perfect. For five months a year (May-September), you’ll get late night and early morning low clouds or fog along the coast. Fortunately, these usually clear up to sunshine by mid morning. These “marine layers” are the price you pay for warmer winters and cooler summers. As I said, no place is totally perfect. But it’s good to know these things up front so there are no surprises after you move in. WHAT IS THE APPLICATION PROCESS? Once you apply, you'll undergo an extensive background check. Your application will be returned if your credit is poor, you've had bankruptcies, if you are on the national landlord's "no rent" tenant list, if you are a smoker, or you've been convicted of a felony. You'll need good references (who will talk) and we do call them. TERMS OF THE LEASE: This is only for the long-term and is not a "vacation" rental. Minimum lease is for one year, preferred length is 2 years If you can't commit to that, it's not for you. If you break your lease, and choose to move before your lease is up, you may incur penalties. WHAT ARE THE COSTS? There are three costs: 1) You'll put the utilities including gas, electric, and telephone in your name, as well as the direct TV satellite service 2) normal replacements costs or minor repairs and, 3) your monthly lease payments. MONTHLY PAYMENTS: Your lease payments will be direct deposited in a nearby bank. No checks please. If you are unable to do that, please contact us. WHAT ELSE SHOULD I KNOW: This is NOT a rural property with ranch qualities. You may NOT store extra vehicles, RVs, horses or boats here. There is room for 2 cars only. There is NO swimming pool and the yard may be used for fencing in pets, but there's no fenced lawn for infants. This is a split-level, so there are stairs. There are four bedrooms; and each have a bath built-in or a bath next to them. WHAT ARE LEASE PAYMENTS? First, here's a bit of background. Before the big real estate meltdown of 2008-2009, the neighborhood houses were valued in the pricey two to four-plus million-dollar range. Realtors say homes near the ocean held their value well during the downturn, so even a 25% drop in value means the neighbor homes are still valued at 2-3 million. A home just three doors down is currently listed for $3.4 million. Typically, homes in luxury areas rent out for 5% of the home's value. A two million dollar home would typically rent for $10,000 a month. 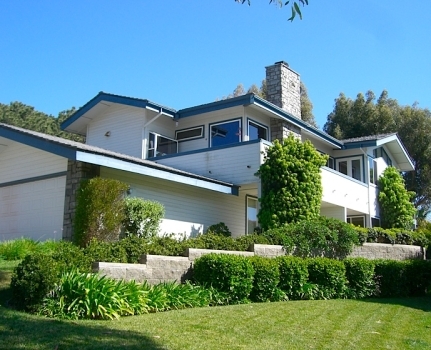 Years ago, tennis legend Martina Navratilova rented the house next door on the north side and actor Tim Conway owned the house on the other (west) side of us for three years before moving. This is a luxury neighborhood in a pricey community. Check the websites for "Del Mar, ocean view, within 2 blocks of the beach, furnished home" and you'll see leases for $7,500 to $15,500 per month. Ouch. But, as you know, times have changed. You'll be able to do much better in this market. In fact, your lease payments will be about 60 cents on the dollar. But you'll have to be the right person and you'll have to act fast. This dream home will likely be taken quickly. Why? It's simple. There are no negotiators, no realtors, and no management company in the way. All of them will charge you extra for their services. They simply raise the lease price, so you pay more. You don't need that. MONTHLY LEASE: There is NO BROKER, so you get the lowest "wholesale" lease price, with no extras added. Your lease is $5,250 a month unfurnished. Each month, you pay for your own utilities but the weekly landscaping service and aquarium services are monthly costs, which are already included in your lease payment. No other extra costs. This is a multi-million dollar home with custom flooring, an exquisite buffet, granite counter tops and tile flooring. The security deposit (refundable) is required and it takes 2 months lease payment to move in. The rest is all set up on auto pay. You'll be given a one-year lease, which guarantees you the same low rate for 12 months. The home may be available for more than the initial lease. When you move out, the security deposit is yours if the stated conditions on the lease are met. 1. HOW DO YOU SEE THE PROPERTY? If you live within driving (or flying) distance and would like to schedule an appointment, email us at eric@jlcbrain.com. If you live out of town and would like more pictures, email us and tell us what you'd like to see pictures of, and we'll email them to you. READ THIS CAREFULLY: there is no "drive by" for lookers. This is a gated security community and we will not give you the address without an appointment. To save you time, please ask your questions on the phone first. If you are serious, we will make an appointment with the current tenants for you. Once you visit the property, we'll follow up with you by email. 2. HOW DO YOU APPLY FOR MOVING IN? It's simple. Let us know by email and we'll send you an application. You can fax the application back to us. Then we'll begin the screening process. We check your credit, your references and finances. You'll be given an opportunity to see the property again to finalize room sizes, spacing and get a second, more detailed look at the house. The current tenants will be happy to show it to you. 3. ONE FINAL THING: Choosing a new place to live is a big decision. It will fundamentally alter your lifestyle, your health and daily joy. If there's anything we can do to help you make that decision, let us know. To start the process, click on eric@jlcbrain.com. We want to get this squared away ASAP. The first application accepted gets the jump - and a fabulous home in paradise. Thank you.